Yeah, yeah… It’s still soupy soup season for us here. Unlike other parts of the world where everyone is basking in golden sun and sand, we, not so privileged ones are snuggling under cosy blanket with a bowl of hot soup and dreaming of all that glorious sunshine. I just have to close my eyes to feel that cool breeze from palm-fringed beaches and lush green fields in my native. We are almost there… Right now while writing this post I can see the sun peeping out of the clouds and smiling. Oh!!! When will he grow up and stop playing that silly peek-a-boo. May be he did hear me grumbling about the same thing again and again. It’s strange as how the weather can be so deceptive. We had early spring in this part of the world and according to the weather forecast (here they come) we are on the way to one of the hottest summers in the history and I am waiting for the day when I can start grumbling about hot and sweaty summer days. Oh!!! Let me stop sulking and come back to my favourite subject. 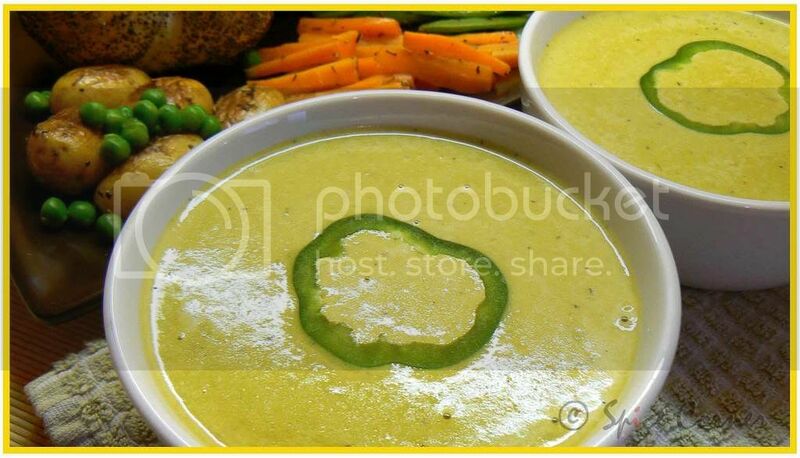 Here is the recipe of Green Pepper Soup which I found in one of my cook books by an anonymous author. I tweaked it to suite my taste and preference, as I usually do most of the times, to create a filling, good tasting bowl of soup. Although it’s little fattening with that cream I sneaked into it, you can always lighten it my using milk in place of cream and modify it to suit your needs. The peppery taste of green capsicum is mellowed with cream which gives it extra richness and taste. 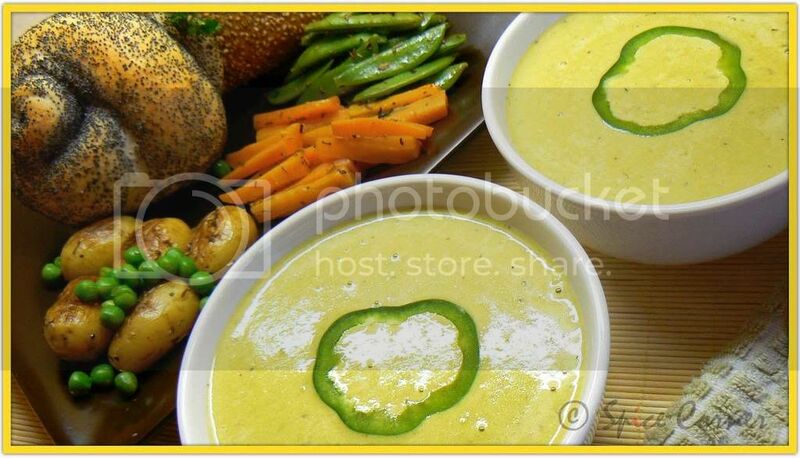 Serve this hot bowl of soup with some bread and boiled vegetables tossed in your favourite herb/spice mix. The recipe below makes 3-4 servings of soup. Heat butter/oil in a pan and add finely chopped garlic and onions. Sauté it at medium flame till onion turns translucent. Now add chopped green peppers and sauté them continuously for about 5-6 minutes till the pepper become soft and skin starts to wilt. Mix the Maida and cook on medium heat for about 2-3 minutes till the raw smell of Maida is gone. Next add about 2 cups of vegetable broth and bring it to boil. Remove the pan from flame and let it completely cool down a bit. Transfer the contents to a food processor and puree the mixture to smooth consistency without adding any more of water. Transfer this puree back to the pan and add vegetable broth, dry mixed herbs and salt and freshly ground pepper to taste. Simmer and cook uncovered till the bubbles are formed at the surface, stirring in between. When the bubbles are formed, mix the fresh cream, lime/lemon juice and adjust the seasoning per taste. Cook this for further 4-5 minutes in medium flame. Garnish with microwaved pepper rings and serve with boiled vegetables and roasted new potatoes and bread of your choice. The bell pepper is low in Saturated Fat, Cholesterol, and Sodium and high in Dietary Fiber, Vitamin A, Vitamin C, Vitamin E, Vitamin K, Vitamin B6, Potassium, Manganese, Thiamin, Riboflavin, Niacin, Folate, Pantothenic Acid and Magnesium. The nutritional value and health benefit of bell pepper makes it ideal for maintaining optimum health and weight loss. So don’t include too much bell pepper in your diet if you are interested in weight gain. PS: Have you noticed a new Foodie Blogroll created by lovely Jenn of Leftover Queen which is for people who have a passion for food? Click here for more information about Foodie Blogroll and join the ever growing community of all the Foodies around the world. looks yummy! Unlike you, we are suffering with hot climate here in southern part of the US. But, inside my office, it is way cool with AC and all and we are wearing sweaters and jackets. No way still raining in GB, boy I hope Mr Sun starts shining bright in the next few days. 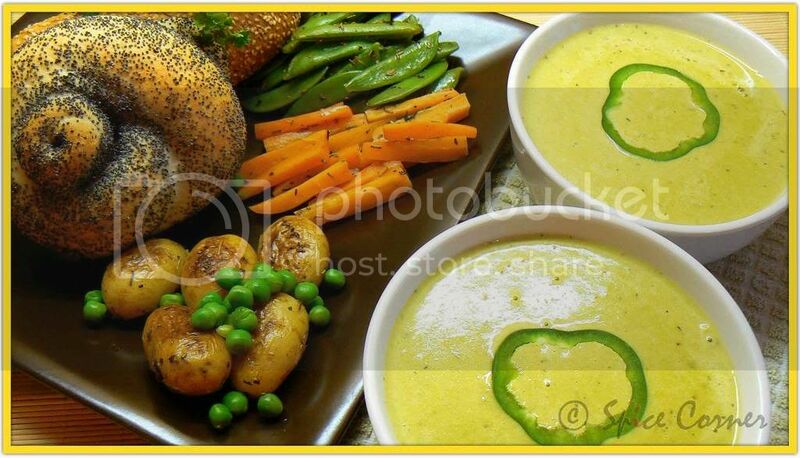 Soup and pics looks absoutely gorgeous. 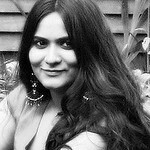 In between wanted to let you know that I love music on your blog, I never heard of Rahul sharma before shame on me !! Looks gorgeous and I love the bread there Sups.You guys do eat lot of veggies,no? !Really good.I will try it next time.Are you cooking breakfast for T? After a long very hot week,we finally got some much needed rain here at NC.Lata is from NC too! It's lot cooler than last week though,which is very good for us. Beautiful beautiful photos!! Love the creaminess of the soup. Your idea of serving soup with boiled vegetables is new to me. i like it a lot! Hi dear...hope sunny uncle listens to all your grumblings and comes active again :) i loved everything there in the photo...ur soup...veggies and that bread too...what variety of bread is that? that bowl of soup sure does look all creamy and YUMMY! and love those bread rolls, they have always been my fav :) the creamy broccoli soup at au bon pain is one of my fav, ur soup looks equally creamy, a must try!!!! Wow Supriya, Beautifup pictures there. As Asha said I love the bread there too. More soup recipes are always and always welcome as we are soup lovers and I love to try out new recipes. I did get you email and I will reply to it soon but I wanted to congratulate you both on your new car. Will mail you soon. Sia that soup looks lovely. Also love your colorful array of vegetables. A great meal. Hi Sia, soup looks very yummy. I just want to see some rain. But no rain here in CA. Sups excellent presentation. Those veggees ,bread and the soup too...ooo good. This is a gorgeous, gorgeous looking soup! The soup looks creamy and smooth and I L-O-V-E the the colour. The pictures look beautiful as usual. mixed herbs.....how abt cloves, cinnamon and pepper? Hmmm... I am addicted... and how! God you girls turn up so many amazing out of this world, yet simple, dishes... and I have have to try! Looks lovely... since I am alone now... maybe tonight itself. Don't have to slave over the stove. wonderful recipe and great looking pictures. Its too hot in Phoenix to even think of peppers! its poppy seeded bread we get in super market. u r a sweetheart dear:) i am sorry to hear that its flooding in guyana... i hope everything is fine there cynth. welcome to spice corner dear:) and thank u for ur compliments. thanks dear:) oh wow!!! send some sunshine here:) we badly need it! hi sia..lovely..thats all i can say..! !soups & cosy blankets seem to good to us here in Indain summer..that info on capsicum was also great..
You are in a soup for sure Sia ;-) Shall soon send some fine weather your way. Soups looks delicious and with your style and presentation...what can I say ? first time i visited your blog....i loved it!would love to see more ur soupy soups!!!!! Oooh Oooh Looks so good and comforting. What a color? So subtle and rich. Love the platter you have laid out there. Can't wait to try this. Bookmarked. Summer or winter, I can have a bowl of soup anytime...and if it happens to look like yours, I might have some more...now, does that sound a bit greedy!!! the soup looks so comforting Sia, I always buy Knorr soups. never tried anything right from scrap. will have to start doing. OMG....This is looking great...YUM!.....As usual beautiful pictures...Great recipe.. Love it..
Hey Sia.. I just posted a new recipe. Can u check pretty please check my blog and say if the pictures are upto scale.. I can really see the difference. Girl u are good !! Well.. I was going to name u capsicum lady. Soupy Sia sounds like a better fit. 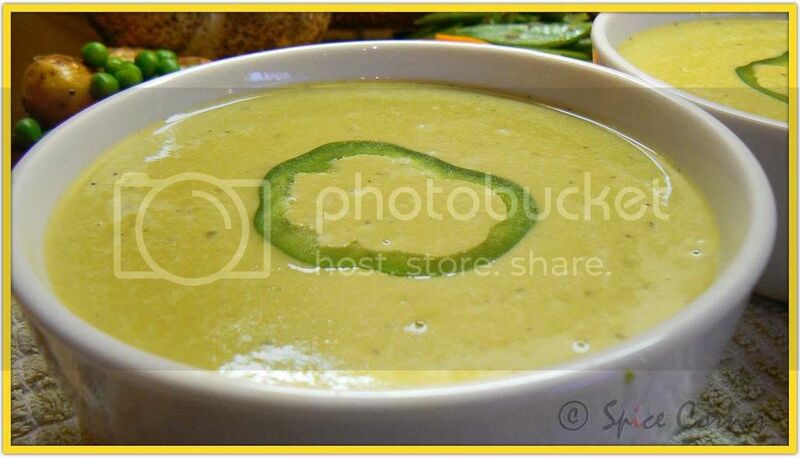 WOW....Looks gr8.......soup and photo looks completely dazzling. It's the season for soups and capsicum in blogs right..:)..didnt know that even bell peppers get into soups..nice innovative recipe.Perfect for a rainy day!thanx a lot for sharing.. If only it was soup season for us, boo hoo! Ugh, you, too? have had my fill of crappy weather here! Hey, the bread roll you have there looks really unique! :) homemade? Sigh, can't believe Hrithik is dancing somewhere near us while we have to stay under the covers, haha..
Oh come to Dubai gal, its 40 Deg C here..... and going to get worse!! I was in UK this time last year and it was sunny and brilliant for 2 days, then it rained and it was dark and gloomy!! It looks so yummy!! The photos are so good. Hasivagtha ide nodtha idre! gosh,where have I been???? That is one gorgeous looking soup and I like that pepper ring in the middle! hope you're doing good...will write you soon! Oh Sia, Please tell me how to copy link to your post Grilled Vegetables with Guacomole. I just can't get it right. ummm.....mouth watering, i love the color of the soup. Btw bread bahala chennagi kanuthe photonalli, yava bread adu? Nimma pics as usual adbhuta! Loved the recipe and pictures. hasive aadre idannu madi kudiyodalva? thanks lady:) its poppy seed bread we get from supermarket. Hello, been visiting your page for a couple of days now. You've posted some amazing recipes! Just one question for the green pepper soup. Can i use water instead of Veg stock? @Munchmany, yes you can use water in place of veg stock.